Board out full-outfitted touring yacht, the Sunrider, for a fantastic cruise past breathtaking coastal scenery to snorkel, swim, and sunbathe at the pristine Marine Preserve at Bahia Santa Maria (Santa Maria Bay). 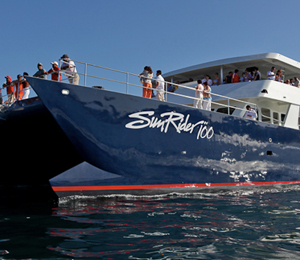 The 60-foot, 65-passenger Sunrider will depart from the Cabo Marina in downtown Cabo San Lucas and cruise past some of the best coastal sights along the shores of Los Cabos, including Pelican's Rock, the Sea Lion colony, the world-famous Arch, and Land's End. Pelican's Rock is a popular scuba diving spot. At the Sea Lion Colony, you'll view scores of these large marine mammals sunning on the rocks and frolicking in the surf. The Arch, a natural vault structure, is the most recognizable and most photographed landmark around Cabo, so be sure to bring your camera. After passing the amazing rocky outcroppings at Land's End, the SunRider will cruise along the coast of Cabo's Golden Corridor. The breathtaking sightseeing tour along the coastline of the Sea of Cortez is worth the trip, but you'll really have fun once you reach the pristine government marine sanctuary at Santa Maria Cove, where you can sunbathe on a sugary beach, swim in the warm waters or snorkel above the splendid underwater reef habitat of the cove. The sheltered waters of this cove are ideal for snorkeling because of the water's clarity and the massive amounts of exotic aquatic species that thrive in the cove. After witnessing the astounding undersea sights while snorkeling, enjoy a refreshing beverage from the SunRider's open bar and relax on the spacious sun deck. The SunRider is fully equipped for your every need, including freshwater showers, his and hers bathrooms, and a full galley, where our crew will prepare a delectable Mexican buffet. I have been to the Bahamas many times, but SunRider Snorkeling Cruise is one of my favorite trips! It includes everything that everyone should do here. As a Bahamas veteran, I can say only the best about this experience!